Publishing daily avalanche situation reports is not active. Exceptional avalanche situations are provided during this time under LWD Tirol. Short, crispy splitboard / backcountry hike ( if abbreviated with the cable car) with an excellent descent only for experienced riders and days of safe snow conditions. Backcountry skiiers often climb down the first 50 meters of the steep channel. ;-). On the A12 exit Kematen, than direction Kühtai, past the galleries, where you might see many cars belonging to ski mountaineers. In the village Kühtai there are enough parking spaces, the best choice is a carpark near the Gaiskogellift. On the slopes we hike along the Gaiskogellift, when we have reached the top station, we already see the mountain station of the Drei Seen Lift. We keep slightly to the right and walk in the direction of the mountain station of the second lift. Once here we can already see the steep ascent to the Gaiskogel Sattel. This is where the real splitboard / backcountry-feeling begins. We go to the east, up to the steep slope reaching the Gaiskogel Sattel. If we have achieved this, depending to the snow conditions we can walk up a little further. If the Terrain is getting to steep for hiking, we mount our splitboards or skies on the backpack and go on to the summit of the Gaiskogel. We check the conditions, have a breake, some food and decide if we can make the descent to the north or not. If we are really good snowboard riders and the conditions (snow, visibility, temperature, avalanche danger, riding skills, ...) fit, we can make the really racy Northface. It begins in an extremely steep and narrow chute (50 meters) and than opens up a in a wide Kar, in which we hold ourselves riding more to the left. We ride through great splitboard / backcountra area, steep enough for having goood fun. At about 2300m, shortly before the middle ridge we introduce a slight turn to the right and ride directly into the Außer Hirschebenen. Here, we just follow our nose until we reach the river. Near the river you can find a bridge, you cross it and you are back to civilasation. Getting back to Kühtai you have several possibilities: Hitch-Hiking up is a good one. Walking down to Haggen and catch a bus is not bad but you need time. 1. April 2014 - 10:54— Log in or sign up to post comments. Waren auf einen unbedeutenden Nachbbar-Gipfel unterwegs. Die Bedingungen dort im Bereich über 2000m waren noch recht gut und in schattigen Lagen auch durchaus noch mit Pulver gesegnet. Die Ausfahrt vom Gaiskogel bedarf allerdings mittlerweile etwas gespühr für die richtige Line da hier die Schneedecke langsam nur noch aus Flecken besteht. 2. March 2014 - 16:22— Log in or sign up to post comments. Wir sind mit Liftunterstützung am späten Vormittag gen Gipfel aufgebrochen. 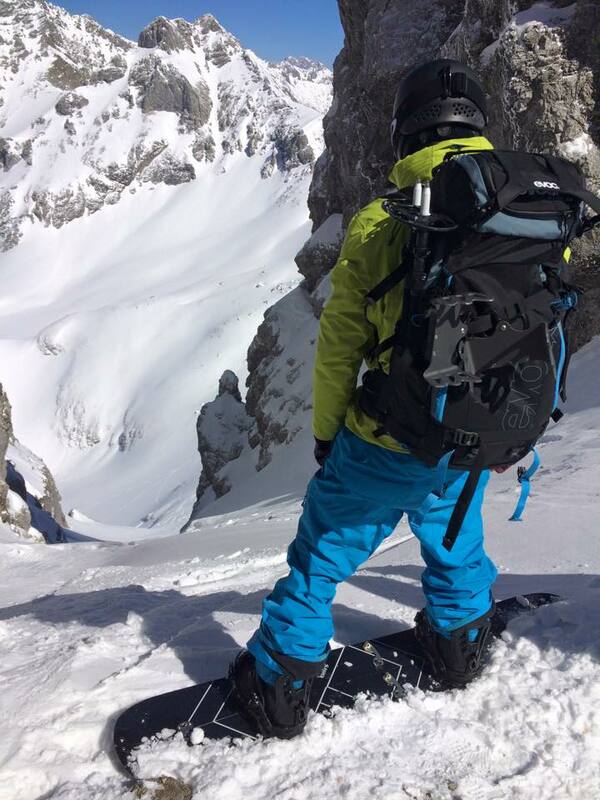 Verhältnisse waren zum Aufstieg gut und der Aufstieg von der Scharte zum Gipfel war anscheinend fast zur hälfte mit Ski begehbar.... wir mussten allerdings Tragen da die Felle unserer Splitboards nicht mehr mit gespielt haben. Die Abfahrt durch die Rinne gen N-NO war schon sehr zerfahren .... allerdings konnten wir unterhalb der Rinne noch gute Hänge mit ausreichendem unverspurtem Tiegschnee finden.